With these 19 plays, the New Play Project ably makes its claim as one of the most ambitious and vibrant going concerns in the world of LDS culture to all of us mission-field Mormons who have only heard rumors and testimonies. 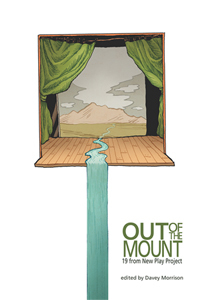 Out of the Mount delivers comedy and tragedy and social commentary, allegory, politics and healthy doses of armchair philosophy and theology in plays that mainly focus on (as most good plays do) relationships that unfold via crackling dialogue. Whether it’s Clark Kent and Lois Lane applying for a marriage license or Adam and Eve feeling their way towards some sort of post-fall rapprochement or young couples falling in and out of love, these playwrights are writing for these latter-days, even when there’s nothing particularly LDS about their characters and settings. That said, what I love most about this anthology is that we get—especially with the fantastic concluding trio of “Gaia,” “Prodigal Son” and “Little Happy Secrets”—works that artfully and poignantly explore key aspects of the grand drama that is the Mormon experience.